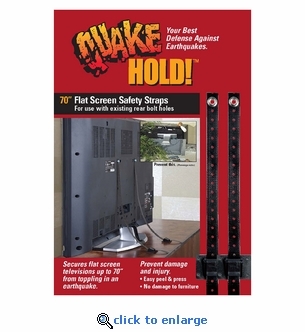 If you live in an earthquake prone area, these flat screen safety straps will protect your investment and keep the TV from falling and injuring children or adults. Each Quakehold Universal Flat-Screen TV Safety Strap kit includes two strong nylon straps, one end attaches to the back of the TV and the other end to your TV stand or wall using peel and press tape. The safety straps will secure up to a 70" TV and 150 lbs. Easy to assemble. Prevents LCD and Plasma flat screen TVs from toppling over during an earthquake. Contour Grip mount design with quick-disconnect buckles for moving and cleaning. Adjustable nylon straps mean no holes have to be drilled. Peel and press application makes installation a breeze. Secures flat screen TVs from 40” up to 70” and150 lbs.